The jury of experts serving for the noted POS-marketing competition awarded the price for a sales display that looks like a perfect copy of the Corny Big cereal bar, making for an effective yet easy-to-handle eye catcher. Sweets are immensely expensive in the Scandinavian countries. This is the reason the so-called Scandinavia shops located on the coast near the ferry docks sell sweets in big packs — which is exactly what this custom packaging was developed for. The big pack comes in the shape of a king-size cereal bar, making it a real eye catcher that draws people’s attention to the popular Corny brand. The display can accommodate up to 32 Corny bars. 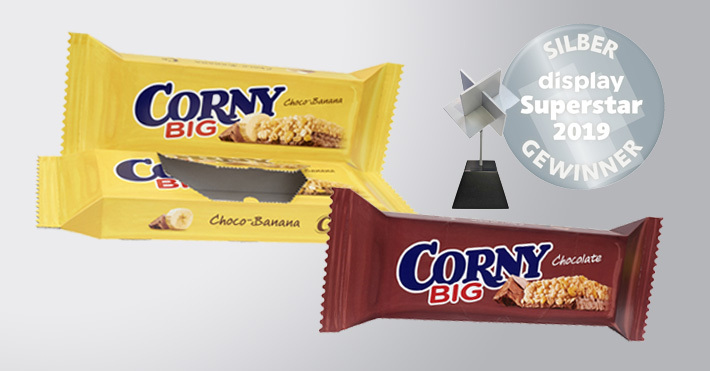 The king-size cereal bar made from corrugated board sees action with different flavours across advertising areas of the Scandinavia shops all year round. The pack is shipped to the Schwartauer company in a flat, horizontal position, where it is loaded and sealed quickly and easily with just a few bits of sticky tape. All of the 93 pieces submitted for the display Superstar Award 2019 were presented at Düsseldorf’s viscom trade show on the days from 8 to 10 January, where they were judged by an expert jury comprising members from the trade and industry, the field of product design, and engineering sciences. 20 pieces brushed in gold, 16 silver, 15 bronze, and 1 platinum.